Burglaries of residential properties account for 74.5% of all burglary offenses. Of those burglaries, almost 60% of them occurr by means of forcible entry. This is why it is so crucial that your home has high quality locks. Door locks are one of your first lines of defense against a potential burglary. However, the locks you can buy at your average hardware store can be easily bypassed even by amateur burglars. We can provide you locks that have been designed to foil the most common methods burglars use to surpass locking hardware. All locks are not the same. If you’ve been getting your locks from a hardware store or other mass outlet, you are not providing a serious deterrence against crooks and you have no control over who has keys to your locks. We recommend Medeco brand locks and keys. These are considerably more secure than any regular system. 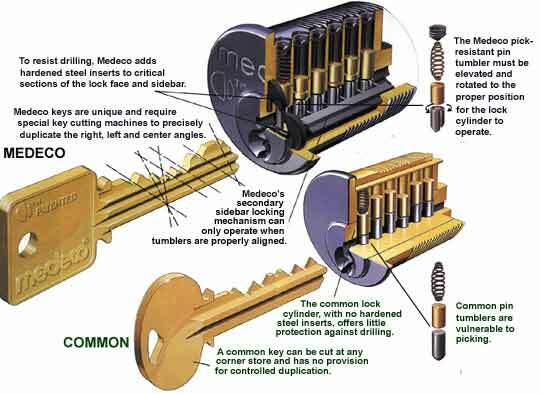 Medeco has figured out many of the ways a burglar would try to break in, and strengthened their locks accordingly. (See Eight Ways A Burglar Can Open Your Door.) Even the keys are special, with three crosscut angles that can’t be duplicated by a local key-copy location. This means that you must get duplicates from a Medeco dealer, and records are kept. It’s also easy for us to change just the keys and lock cylinders (as opposed to changing the whole lock) whenever you need to rekey because of a change in ownership, tenants, or to ensure against misuse of lost keys. This gives you more control and lower costs for years to come. Check out this video by Medeco comparing their lock against a hardware store lock. Do you know who has keys to your locks right now? Do you allow contractors, babysitters, hired help and others to borrow your set of keys? Is it OK for those people to get their own duplicate keys without you knowing? The last time you went to Wal-Mart or a hardware store for a key, did they ask you for ID? 33.9% of burglaries involve unlawful entries. That means the burglar either had a coy of the key or the premise was left unlocked. A simple rekey or remembering to lock the door would have prevented almost 40% of all burglaries. This is why installing locks with key control is so important. We can make sure that anyone you give a key to can’t make a duplicate copy without your knowledge and permission! What’s the additional cost? Minimal, by comparison, to the losses or harm you could incur; the average dollar loss per burglary offense is $2,230. While you’re at it, getting rid of any hardware store locks will not only strengthen your security, but also save you money in the long run. Why? Some cheap locks must be thrown out because they can’t be rekeyed. With better locks, like Medeco, you simply replace the “guts,” or the internal locking pins, to match a new key. We sell only premium brands. They are not only safe, but they add beauty and “curb appeal” to our building. Ask us about the most economical way to replace your old, non-secure locks. This is also the time to consider stepping up to “keyless” entry. We can provide you with a wide range of electronic combination locks, or “smart” devices such as proximity cards and finger (and face, hand, voice, etc.) recognition systems. Automotive keys (including the ones with the new chips in the heads of them and the “laser” cut keys that are on some of the newer cars; we have the programmer to program most of the new automotive security keys). We even offer keys that only you can have duplicated such as the restricted Medeco, Mul-T-Lock, Assa and Kaba keys. If you are unsure of what type of key you have, do not hesitate to bring it to us and see if we have it. (Most likely we do!) Crime statistics were from the 2012 FBI Crime Statistics report. Click Here & Here for the source.